Patagonia Under Siege: Norway's SN Power (Statkraft Norfund) suspends $600 million hydro-electric project in Chile's Mapuche heartland after virulent local protests. Norway's SN Power (Statkraft Norfund) suspends $600 million hydro-electric project in Chile's Mapuche heartland after virulent local protests. Following a meeting between the top executive for Latin America of the Norwegian firm and the leader of the indigenous communities on 11 December, in Oslo, the European company decided to suspend their activities. The pressure exerted by the negative reaction and the Mapuche communities were stronger. The Norwegian company SN Power decided to suspend work on the million dollar hydroelectric project in the Region of Rivers, after opposition from its inhabitants. This suspends the work of the largest European company that is developing in the country. The decision to postpone the activities surrounding the project was taken on December 11, in Oslo, Norway. In that country, Nils Huseby, executive vice president for Latin America SN Power, met with Peter Antimilla, representative of the Mapuche communities of Coñaripe, at the seminar "The New Conquistadors? 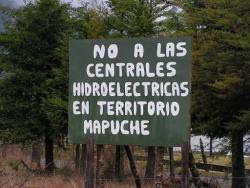 SN Power: Hydropower in the Mapuche Territory". Antimilla explained the rejection of the communities to the construction of power stations. "We do not want interference in our territories. They say that the plants will have no impact because they will not have reservoirs, but instead will inundate 120 hectares, will drill 20 miles of tunnels and trenches 300 meters deep. Just the Central Pellaifa project will affect more than eight thousand people, " he says. Following the presentation, said Antimilla, the Norwegian executive requested a meeting. "We met for four hours and a pledge was made that all works related to the project will be suspended until the principal directors of the company will meet with all the affected communities," he says. The meeting with the residents, he added, will take place at the Region X by the end of January. The day after the meeting in Oslo, Huseby sent a letter to Antimilla. "I would like to reiterate our desire and commitment to meet with representatives of indigenous communities, at a time and date suggested by you in January 2008, to hear thier position on our projects and to establish the principles of a possible dialogue," says the missive. It adds that "we confirm our commitment to maintain the current suspension of activities related to our projects until that meeting has been made." Antimilla said that "for us it is a very important measure, because although not yet started, construction of the plants was halted as well as all work for collecting information." In addition, he explains, in the Oslo meeting, Huseby raised two options for the future construction of the four plants. "He said that one way might be to move the project elsewhere or make the project smaller." Regarding the meeting, Huseby added that "hope will be a first step in establishing a permanent and fruitful dialogue, so that the project’s design contributes to the sustainable development of the areas where located (...) We are conducting a comprehensive process of meetings, we have collected more than 1,000 people in the area, representing 25 organizations and we opened information offices in Coñaripe, Liquiñe, Panguipulli and Futrono, to fully cover the area and create meeting places. " The suspension could delay the launch of the project. What are the details of this million-dollar hydroelectric project? The project involves an investment of more than $ 600 million and will add 580 megawatts (MW) of power to the Central Interconnected System (SIC) in the coming years. At the forefront, is the leading hydroelectric generator, SN Power of Norway and the second largest generator of renewable energy in Europe. 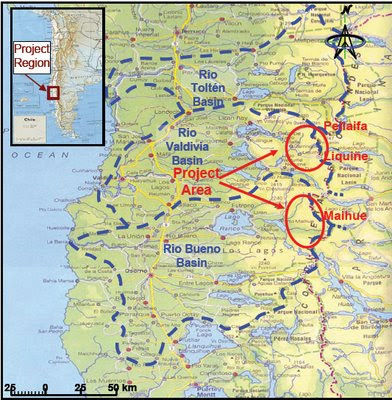 Through its subsidiary Hydro-Trayenko, where it has 80% of the property and is linked to the Chilean businessman Gustavo Pavez, with the other 20% - the foreign firm conducts feasibility and technical studies and exploratory analysis for the construction of four hydroelectric plants in Region X in the communes of Panguipulli, Futrono and Lago Ranco. These run of the river plants (without reservoir) are: Pellaifa (108 MW), Maqueo (320 MW), Liquiñe (118 MW) and Reyehueico (34 MW). According to the timetable, the decision to commence will be taken in 2009. The entry into operation of the four projects was scheduled for 2013.